Become a property tycoon with just a swipe of your card with Monopoly Electronic Banking! This up to date new version of the classic games uses bank cards instead of cash, so you can collect rent, buy houses and hotels and pay those nasty fines with a simple press of a button! A super updating of the original game with more realistic property values and trendy locations around London including the King's Road and Docklands. 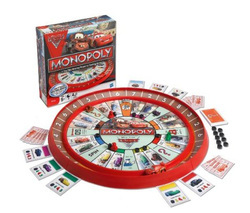 Which Monopoly Set is Best for Christmas 2011? Now, there's a leading question! We loved last years' round-board Monopoly Revolutions, which looked and felt very trendy. So, at the risk of upsetting Tesco's buyers, we actually think the Monopoly Disney Pixar Cars 2 Edition will be a really popular Christmas 2011 present for younger boys and girls because of its round shape and easy, movie linked playing style. See our Monopoly Disney Pixar Cars 2 Game page for full details.